Below are the first set of interrogatories in a birth injury case against an OB/GYN. There are a few contention interrogatories in this set. But this is mostly an effort to collect the basic facts of the defendant's case. Because the parents typically also have claims in a birth injury case, you can use their interrogatories for more specific lines of inquiry as your case develops. Plaintiff, Sandy Monroe, individually, by and through her attorneys, Miller & Zois, LLC, and pursuant to Maryland Rule 2-424, requests that Donald W. Dennis, M.D. submits responses to the below Interrogatories within 30 days of the service of this pleading. Now comes Plaintiff, Sandy Monroe requests Defendant Donald Dennis, M.D., submit responses to the below Interrogatories in accordance with the Maryland Rules. Unless otherwise stated, the subject matter of these Interrogatories pertain to the medical care and treatment which Michael and Sandy Monroe received at Maryland Memorial Hospital on or about May 14, 2015. These Interrogatories are continuing in character so as to require you to file supplementary answers if you obtain any further, or different, information before trial. Where name and identity of a person is required, please state full name, home address, and business address. Where knowledge or information in possession of a party is requested, such request includes knowledge of the party's agents, representatives, and unless privileged, his attorney's. When an answer is made by a corporate defendant, state the name, address, and title of the person(s) supplying the information and making the affidavit and announce the source of his or her information. "Identify" when referring to an individual, corporation, or other entity shall mean to set forth the name and telephone number, and if a corporation or other entity, its principle place of business, or if an individual, the present or last known home address, his or her job title(s), by whom employed by, and address of the place of employment. Michael Monroe is the baby boy born on May 14, 2015, to Sandy Monroe and also pertains to the fetus that was inside Sandy Monroe's body before she gave birth on May 14, 2015. An evasive or incomplete answer is deemed to be a failure to answer. As you know, you are under a continuing duty to supplement your answers to these interrogatories. You are also under a continuing duty to correct any response that you later determine is incorrect. If you yourself intend to offer any expert opinion in this case to specifically include whether you followed the applicable standard of medical care, or intend to offer or rely upon the opinion of any expert witness, then name all experts you propose to call as witnesses, to include yourself, and for each describe the nature of their specialties, experience, training, medical affiliations, and all opinions which they have reached/rendered and the factual basis for each such opinion to include your opinions as well. Attach to your answer copies of all written reports made by each expert. Describe any previous personal or professional dealings you have had with any expert in this case. State the name, address, telephone number, and position of each person having personal knowledge of facts material to this case. Include your own full name, address, employer, title, position and social security number. 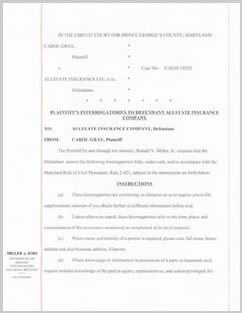 If you have obtained any written or recorded statements concerning the occurrence referenced in Plaintiffs' Complaint, set forth the name and address of the person who gave the statement/recording, the date the statement was made, the content of the statement, and the present custodian of the statement. Do you contend a party, or person not a party to this action, acted in such a manner as to cause or contribute to the occurrence referenced in the Plaintiffs' Complaint, then give a complete statement of facts upon which you rely and provide the name, address, and telephone number of any persons with personal knowledge of facts upon which you so rely. If you contend Michael Monroe's neurological injuries were proximately caused by anything other than the complications from the labor and delivery at Maryland Memorial Hospital on May 14, 2015, then explain what you claim was the proximate cause of Michael Monroe's neurological injuries and provide a complete statement of the facts upon which you rely upon and identify any and all medical providers who will support this contention. If you are aware of the existence of any pictures, movies, computer-generated evidence, electronically stored data, PowerPoint presentations, videotapes, diagrams, x-rays, documents, reports, medical illustrations, and objects (real evidence) relative to the occurrence or the issue of damages, then identify each such item, state the date produced or obtained, and the name and address of the present custodian of each such demonstrative item. State whether you were named or covered under any policy of medical liability insurance at the time of care and treatment alleged in this lawsuit. If so, name of the company, policy number, effective period and maximum liability limits for policy, including the maximum liability limits for each person and occurrence and the aggregate amount of coverage of each policy. State whether you were employed by, or were a member of, any partnership, professional association, professional corporation, and/or any other legal entity providing health care at any time during your treatment and examination of Sandy and Michael Monroe and acting within the scope of that employment when you provided treatment to Sandy and Michael Monroe. If yes, indicate the name of such employment, partnership, professional association, professional corporation, or legal entity and provide the name and addresses of each employer, partner, president, treasurer, or shareholder and indicate the nature and degree of interest in such partnership, professional association, professional corporation, and legal entity. If said partnership, professional association, professional corporation, and/or legal entity is no longer in existence, then indicate the date and manner of dissolution. Identify and give the substance of each statement, action, omission, or declaration against interest, whether oral or written, by conduct, silence, or otherwise which you contend was made by, or on behalf of, Sandy Monroe and Leroy Monroe, and provide the place and date when each such statement was made and to whom the statement was made. State whether you have in your practice and/or facility, to include Maryland Memorial Hospital, any policy, rule, regulation, procedure, protocol, guideline, clinical pathway, order set, and standard concerning or referring to the diagnose and treatment of fetal hypoxia and/or fetal distress during labor and delivery. This would include the procedures for addressing any abnormalities identified on fetal heart rate monitors, including, Category II and III tracings. If so, then please identify and explain in detail each such policy, rule, regulation, procedure, protocol, guideline, clinical pathway, order set, and standard. Please identify any and all medical textbooks, medical journals, medical articles, treatises, publications, and any other form of medical literature which you or any of your experts believe is reasonably reliable and/or authoritative in the fields of medicine at issue in this case, to include, but not limited to, fetal hypoxia fetal distress, fetal heart rate monitoring, and hypoxic brain injury. Please describe in detail any and all policies, guidelines, protocols, medical standards, clinical pathways, and order sets in place at Maryland Memorial Hospital at the time you cared for Sandy and Michael Monroe about the reading, interpreting, and reporting of information obtained from fetal heart rate monitors. If you claim any of Sandy and/or Michael Monroe's medical records are missing information, contain any incorrect or false information, or any information was modified in any way, shape, or form, please identify the specific page of the medical record, the date and time of the entry, identify the information which is missing, identify which information is false/incorrect, and state which information has been modified or changed. Please describe in detail any and all policies, guidelines, protocols, medical standards, clinical pathways, and order sets in place at Maryland Memorial Hospital at the time you cared for Sandy and Michael Monroe pertaining to operative vaginal deliveries, including, but not limited to, the use of vacuum assisted delivery devices and forceps. Please state when you first learned that Michael Monroe had a nuchal cord wrapped around his neck, how you learned this information, and what, if any, measures you took to treat the nuchal cord wrapped around Michael Monroe's neck. Did you have the knowledge, training, and education to accurately read and interpret fetal heart strips and determine whether a baby such as Michael Monroe is showing signs or symptoms of fetal distress and/or fetal hypoxia when you provided medical care to Sandy Monroe and Michael Monroe? Did you suspect and or conclude that Michael Monroe had a Category II and/or Category III tracing at any point while you cared for Sandy Monroe on May 14, 2015. If so, please identify the date and exact time of such tracings. Please describe what actions you took in response to Michael Monroe's Category II and Category III tracings, including, but not limited to, what resuscitative measures you took as well as any conversations you had with a physician and/or nurse. Include in your answer your thinking on why Pitocin continued to be administered to Ms. Monroe up to the time of delivery. Did you suspected or conclude that Michael Monroe was having late decelerations and an increased baseline heart rate while you cared for Sandy Monroe at Maryland Memorial. If so, please identify the date and exact time of such late decelerations and the significance you placed at the time on these decelerations. In each instance when you suspected and or concluded Michael Monroe experienced late decelerations and an increased baseline heart rate, please indicate what resuscitative measures you took as well as any conversations you had with a physician, nurse, and Sandy Monroe. Please state what, if any, actions you took in response to Megan Huth, RN notifying you that Michael Monroe was experiencing fetal heart rate decelerations at approximately 4:35 a.m. on May 14, 2015. Please state whether the option of a cesarean section, as opposed to a vaginal delivery, was ever presented to Sandy Monroe. If so, please state the exact date(s) and time(s), of this conversation(s) , including whether you discussed the risks, benefits, and alternatives of each, and the names of the healthcare providers present when this conversation took place. Please state whether Michael Monroe had any signs and symptoms of fetal distress and/or fetal hypoxia during the time you cared for Sandy Monroe at Maryland Memorial. This would include any signs and symptoms of fetal distress and/or hypoxia that were identified on the fetal heart rate strips, and indicate the date and time when these signs and symptoms occurred and how you learned of same. Please state all the reasons you decided to have Sandy Monroe undergo a vaginal delivery, as opposed to a cesarean section between the hours of at 1:00 a.m. and 5:51 a.m. on May 14, 2015. Please state all the reasons you chose to perform a vacuum assisted delivery followed by the use of forceps as opposed to a cesarean section at approximately 1:30 a.m.on May 14, 2015. How long do you believe it would take the doctors at Maryland Memorial to perform a stat c-section? If you claim that Michael Monroe was in distress and exposed to a loss of oxygen and an hypoxic injury during his delivery, then explain in detail the basis for this contention, and the exact minute that you suspected or concluded that Michael Monroe was experiencing a loss of oxygen supply during his delivery significant enough to cause an hypoxic injury.